Why list your home for sale with Nick Bastian? We’re glad you asked! Nick has been in the real estate business for more than 26 years. He has built a client base of many repeat customers and clients because of his ability to look out for YOUR best interest. No two real estate transactions are alike and each one has many moving parts and pieces. As an experienced real estate agent, Nick can and will guide you through the process to help maximize your time and your money. Most people only sell a small handful of properties in their lifetime. Nick has sold hundreds of properties and will be a great asset to you in the sale of yours. Nick is a true student of the game. Real estate transactions can be very complex and each one is different from the next. The purchase contract, inspection process, disclosure processes, contract addendums, buyer and seller obligations, and liability issues are all things in which many people want or need guidance. Never hire an agent that does not have the experience or confidence needed to help guide you through the entire process. Going it alone or hiring an amateur might seem like it could save you some money, but in reality, it can be very expensive. Nick has been asked to teach marketing classes for the Arizona Association of REALTORS and the National Association of REALTORS. His systems work and his knowledge of the business is well respected by his peers. Trust is something that is earned. It takes years to build and just minutes to lose. When you hire Nick Bastian to sell your home, you can be assured that he will look out for your best interest and will always put your wants and needs first. We don’t cut corners and we don’t compromise your position. Nick hasn’t built his successful career on commission checks, he builds it with relationships. Don’t be fooled by the allure of some “instant offer” nonsense. Call someone you can trust. Nick takes his job very seriously. Each client is always treated with respect and is given his utmost attention. The real estate industry is constantly changing and Nick prides himself in keeping up with trends in the market, as well as making sure he spends a lot of time with many of the best minds in the business. Nick is involved with several “master mind” groups with brokers and legal council to stay on top of his game in an ever-changing world. Nick and his team provide excellent marketing programs designed for each and every home we sell. From proper pricing to professional photography, print marketing, direct mail, social media campaigns and custom built web pages for each individual property, we custom design a campaign just for you. Here are a few links of sample marketing pieces we use to get your home sold. Unlike some “mega-teams” where personal service is a thing of the past, our team is designed so that you are informed and involved with Nick and his staff at every step of the transaction. We personally answer the phone seven days a week (some holidays are taken off ), and we each have very specific roles in helping you sell your home. Nick’s experience in working with hundreds of home sellers will be a huge benefit to you. Our amazing marketing and office staff are on hand to make sure every minute detail is handled professionally, timely and effectively. Click this client testimonials link to read what people have to say about working with the Nick Bastian team of professionals. We always have your best interest in mind when representing you in the sale (or purchase) of a home. 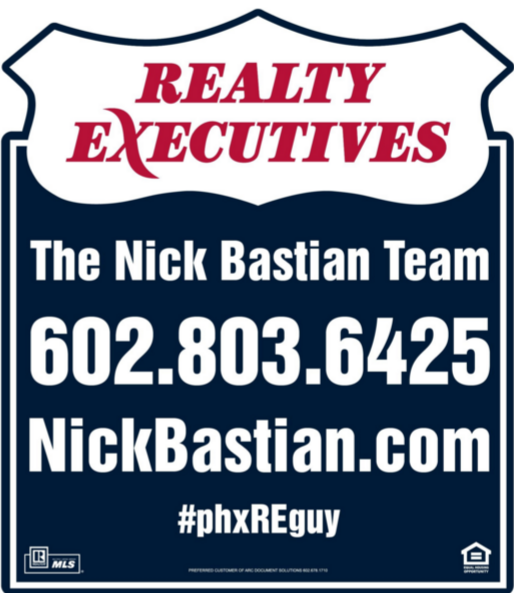 Please feel free to call The Nick Bastian Team today at 602-803-6425. We’re here to help!